It has been an amazing day here at BYUI's Education Week, and I have tons of photos, but no Internet. Typing blogposts on my iPhone is a little tough, so if anyone is reading this (Mom), I'll post my photos soon. Yesterday my children and I made a 700-mile trip in our minivan in order to visit Grandma Peggy (Eric's mom). Alia asked me lots of questions and quizzed me on Spanish phrases along the way so I wouldn't get tired. There's this beautiful, tree-lined road leading up to Grandma's house, and the children begged to run the whole way. Spencer had to run in his diaper because he had a huge diaper leak at the previous stop, but they were so excited that I couldn't say no. Today has been an absolute vacation for me, thanks to Grandma Peggy, Aunt Jodi, Aunt Tara, and Uncle Marc. I got to sleep in until 10:30 for the first time in YEARS, and we got to spend the whole day relaxing with the family. Ethan (age 7) loves the sunsets here. He said, "Mom! You've got to come out here and see the sky!" And then tonight, Aunt Jodi helped my children put blankets all over the trampoline, and they laid there forever, watching the distant lightening, listening to the thunder, and seriously enjoying their childhood (except when Ethan stepped on Alia's blanket, Spencer took Grace's pillow, and everyone kept bouncing too much). I feel like I'm constantly saying, "Kindness! In our family we speak kindly!" I've got to get to bed now.... Tomorrow I drive up to Idaho with my dear friend Allyson (who I've only met in person twice, but we feel like we've known each other forever). Two of my sisters (Page and Susan), Saren, and my freshman roommate, Shawna, are going to join us up there for the "Mom Track" of Education Week. I've been looking forward to this since last summer. My main hope is that this conference will be helpful to all the moms who attend. I've done my best to make the classes conversational, so it's not me up there lecturing the whole time. I know that as these sharp women come together to learn and lift each other, all of their families will be strengthened. I'm going to try to blog a little bit each day while I'm there, so if you're dying to know all the details, check back! Spencer and I bonded during this sweet moment the other day. I said "yes" to straws, and he wanted two in his drink, and then he wanted to share, and I was so excited to be drinking lemonade with my little cutie that I asked Alia to take some photos of us together. These two pictures pretty much sum up my life right now. One moment everyone is happy--singing songs around the piano, watching "parachute man" fly up above the gusty air conditioning unit in the backyard, or cracking pistachios like there's no tomorrow--and then a minute later it's like they've transformed into a bunch of crazies. I learned long ago that it's silly to expect life to be wonderful 24/7. We have to find happiness in snatches. I'll keep focusing on photo #1, and I'll eventually laugh at photo #2. Good, good times. Labels: Capturing Moments, The Motherhood "Mind Game"
This talk by Jeffrey R. Holland (from The Church of Jesus Christ of Latter-day Saints) is one of my very favorites. I've been reading and re-reading it for years, but it meant so much more as I watched these precious video clips alongside the audio recording of the talk. This counsel (referring to our reliance on Jesus Christ) has echoed in my ears more times than I can count: "Rely on Him. Rely on Him heavily. Rely on Him forever." That is sometimes the only thing that holds me together--knowing that I don't have to do any of this alone. I also love the part of this video that references the angels who watch over mothers. Even though I don't see angels walking the halls of my home, I feel a special protection and the love of God here with me. 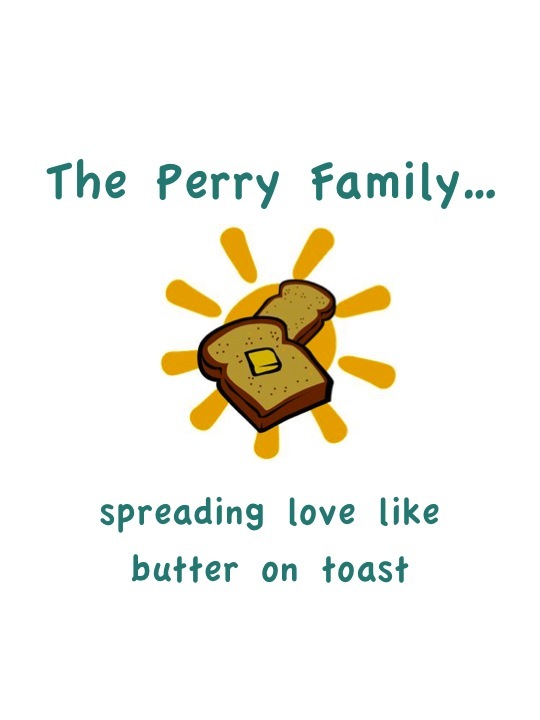 I am REALLY excited about the family t-shirts we're making for Aspen Grove. When I was taking family science classes in college, we learned that building family unity helps children feel connected to their parents and siblings (and helps them not look for acceptance elsewhere, in situations that might not be beneficial to them). Even though we've tried to have fun family traditions over the past several years, I've been mostly in "survival mode," so I haven't had the frame of mind to make something like family t-shirts. So here are the templates we just made. We're printing them onto Avery fabric transfer paper and ironing them onto white t-shirts this afternoon. The children are as giddy with excitement as I am. And now...here is one for Eric. 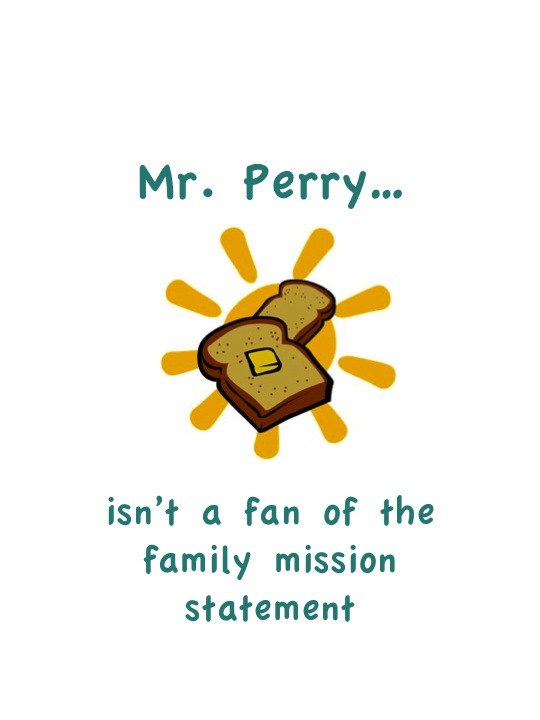 He thinks our family mission statement is kind of crazy, so I told him I'd make a special shirt just for him! Oh, we are going to have some fun. Are you tired of your refrigerator looking like this? I completely understand. I used to have dozens of items stuck to my fridge, but once I read Getting Things Done by David Allen, all that changed. The secret to a clear refrigerator is the tickler file. I'm so in love with it that I wrote up a guest post for David Allen's blog, GTD Times, and it posted this week. A couple of months ago, we (at The Power of Moms) released version one of Mind Organization for Moms--an online program based on David Allen's book. It's designed to help moms get their papers, tasks, goals, and ideas organized into a system that will help them finally enjoy their families. We've got hundreds of mothers using the system, and version two will be coming out in the next month or so (most likely once the children are back in school). Exciting! I can't say enough about the GTD system. It's seriously incredible, and it has enabled me to juggle more than ever before while still feeling somewhat on top of things. The best part is that I am enjoying my husband and children more now than ever before. You can't put a price tag on that. If you're interested in trying out Mind Organization for Moms, we're still offering it free of charge to anyone who shares the site with 30 friends. This morning I wanted 20 minutes of "alone time" to follow along with an exercise DVD. My children had eaten breakfast, they were happily playing with toys, and my husband was downstairs reading, so I carried my laptop upstairs where I locked myself in my room and proceeded to do jumping jacks, push-ups, etc. Five minutes into the routine, my two-year-old made somebody mad, squealing emerged from multiple mouths, and my husband needed to start getting ready for work (I was totally in his way). My son started pounding on the bedroom door, pleading with me to come downstairs, and my husband tried to coerce him to go play for just a few more minutes until Mommy was done exercising. Dripping with sweat and feeling sufficiently annoyed with the circumstances, I said, "It would be easier if I didn't exercise." My husband got a smile on his face and said, "Yes. Yes it would." And I knew what he was thinking. Life would be easier if we didn't try to do hard things (that's a no-brainer), but we're not looking for easy. We're looking for progress. And progress requires work. This photo below makes me want to laugh and cry at the same time. The other morning, I woke up early to study my scriptures and get some work done on Power of Moms and the classes I'm teaching at BYU Idaho's Education Week at the end of this month. Here I am at 7:10 a.m. in all my glory--no make-up, my hair back in a ponytail, sitting in my office, which is currently stacked with books, boxes, and all kinds of things my husband and I are processing. What usually happens is this: Spencer (age 2) wakes up at 5:30, and I take him downstairs where he gets a diaper change, a sippy cup of milk, and his choice of a cartoon (usually Barney or Diego). Then my older children wake up, join Spencer downstairs, eat some cereal, and then play with toys, read, etc. for a little while. Then when they are tired of that, they all come sit right next to me and "help" me work. Spencer likes to type on the computer, so I tell him which letters to push (I type 10, he types 1, and so on...). The girls like to know what I'm working on, so I read them my notes, show them my PowerPoints, and ask for advice on making my classes or articles more interesting. Then when I feel like I'm going crazy (usually about three minutes into this process), I shut the computer, and we all go downstairs to get the day started. Would it be easier if I didn't try to do anything "extra"? Do I sometimes feel like I'm about to go insane? But do I know that I'm doing what I'm supposed to be doing right now? Yes on all counts. Life requires a struggle, but I don't need to be afraid of struggle. It has the power to strengthen us, help us become a little more bold, and give us a few more reasons to be happy. So next time you think, "It would be easier if I didn't __________," just smile, recommit yourself to excellence, and say, "Yes. Yes it would." My husband has been gone for the past week, and I miss him like crazy. He'll be walking in the door any minute, and my heart is fluttering like when we were dating. It's funny how I don't appreciate how much he does for us until he's gone. I've got to change that. Before I close my computer for the night, I want to write about some happy things that have been going on in our home these past few days. I'm still trying to figure out what I want this blog to be, and I don't know if anyone out there needs to know what I'm thinking, but if nothing else, I want to record the fact that my life isn't always crazy, and I'm not always stressed out (because that's how things have seemed for me lately). Happy Thought #1: Ten-year-olds are wonderful. Today my daughter Alia spent an hour in the bathroom helping two-year-old Spencer practice using the potty. She helped him get settled, brought him several popsicles, set up the fan in the corner of the bathroom when it got stuffy, and even carried the laptop in there so he could watch Barney on Netflix. He didn't have an ounce of success, but it did my heart good to see my oldest helping my youngest. "A mother is someone who knows the song in your heart and can sing it back to you when you have forgotten the words" -Unknown. I cried when I read that because that's exactly how I feel about my mom. Whenever I doubt myself or feel down about my progress in life, I talk to my mom, and she "sings the song of my heart." I want to be that way for my own children. Happy Thought #4: Eric's home! Gotta run. I'm so excited! I feel totally strapped for time lately. The older I get, the more responsibilities I have, and it seems like every moment offers a thousand things to do--all of them "good" uses of my time. What I've found, however, is that I find more purpose and meaning in my life when I give my children a gift they crave--uninterrupted time with Mom. It hasn't been easy to do this, and I'm far from perfect, but here are some things that are working for us right now--even in the midst of our chaos, and even though I'm busier now than I've ever been in my life. (1) I occasionally let my children alternate who gets to stay up a little bit later for some one-on-one time. My two-year-old demands it from me all day, so he goes right to bed after our stories, prayers, and lullabies (my FAVORITE time of the day with him...so cute). 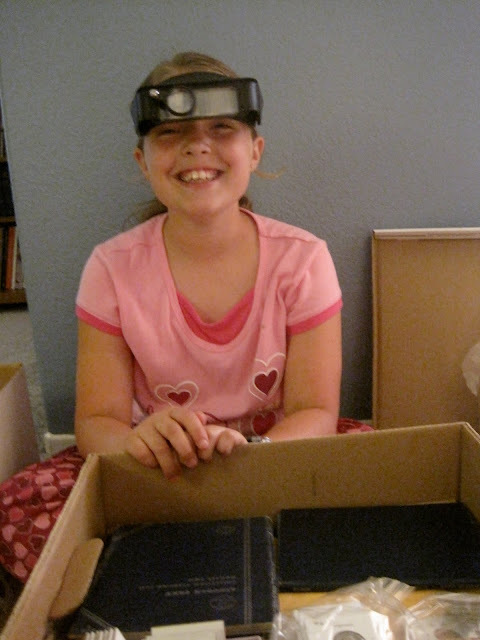 Then my three oldest take turns staying up and choosing an activity they want to do for 20-25 minutes. 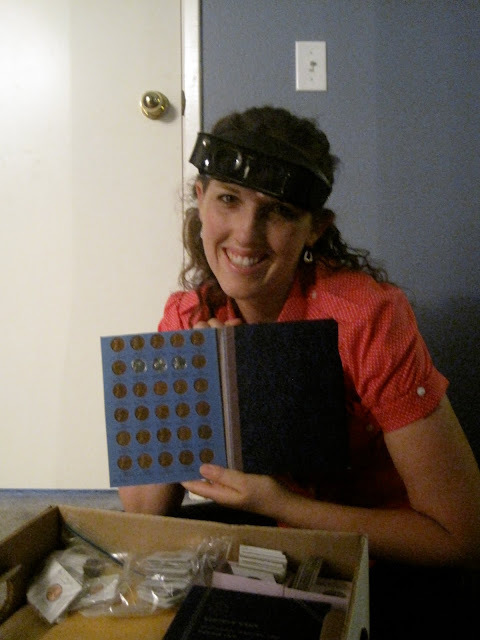 One evening, my daughter Alia wanted to look through some coins her great-grandpa gave us for Christmas. He even gave us this cool magnifying glass you can wear on your head. Is that not so fun? I had to take a turn. We don't always go through boxes of coins. Sometimes we just sit on my bed and snuggle. Other times, we play a game, listen to music, or paint our toenails. And we don't do this every night--maybe once a week. It's been great, though--a time to build memories and really enjoy being together. I've discovered that the activity is irrelevant. What ends up happening is that we talk about things that are on their minds--things like relationships with their friends at school, weird things they've been hearing on the playground, or the "facts of life." There are so many things my children won't say while I'm dishing up dinner or driving to the park. The setting has got to be right. (2) We alternate "date nights" between mom and dad and each of the children. The budget is $5, the time allotment is about 90 minutes, and the benefits are unbelievable. We talk about these dates all the time--even though they only happen once or twice a month. Our family feels close. We love being together, and we look forward to spending time one-on-one. I love it. (3) One final thing I'll mention is that my husband and I both try to take advantage of the "little moments" of the day. Whenever our children sit down by us, we hug them and kiss them and say, "Do you know how much I love you?" When someone asks a serious question, we try to drop everything we can to sit and answer it clearly. When someone feels sad or misunderstood or excited to share something important, we stop and take the time to really listen. I don't know if I'll ever be perfect at this, but the more I try, the better it gets. We're juggling messes and whining and bickering and mistakes all day long, but somehow those things don't seem to matter when the most important things are in the right place. If anyone has any other ideas to add, I'd love to hear them. I learn so much from my online friends, and I know my children will appreciate any advice you have to offer. We all will! I was having one of those mornings where I was trying to do too many things at once. I wanted to exercise, clean the house, read with my children, and get everyone looking presentable and out the door by nine. It didn't happen. During our morning clean-up, I asked my daughter to please go out to the garage to clean up her pencil shavings (that somehow got dumped all over the place). When she got out there, she saw that the freezer door had been left open, and water had leaked all over the floor. We spent the next 20 minutes emptying the freezer, mopping up water, and trying to be nice to each other--even though we were all feeling quite cranky. We went to the park to play baseball, and my daughter Grace picked this dandelion bouquet for me. I said, "Thank you, Grace, but I don't have anywhere to put it right now." She said, "Just put it in your pocket!" So I did. Every time I looked down, I saw this sweet little gift poking out of the pocket of my jeans. I couldn't help but smile and think, "This is what motherhood is all about." Today is another day. I know there are going to be sours, but I also know there are going to be many, many sweets. You can't have one without the other, and I wouldn't trade them for anything. This makes me laugh...but wouldn't it be fun if every mom could be part of a supportive community of mothers the second she got home from the hospital? That's our vision. 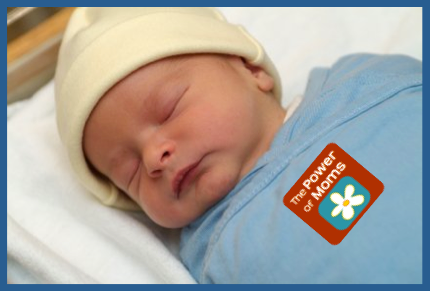 New moms are born every day, and we want them to be part of The Power of Moms. Saren and I had a "Power of Moms" phone call this morning that I just had to write about. She was in the car with her husband and five children, driving to Bear Lake for an Eyre Family Reunion, and I was running circles around my kitchen, trying desperately to carry on a normal conversation while I juggled way too many things at the same time. SAREN: Okay, so I absolutely agree that we need to do a better job reaching out to a more diverse group of moms...guys, shhhh. APRIL (while wiping counters): Yes, let's start working on those ideas we've been emailing back and forth. Do NOT take those bubbles into the living room. Outside. Bubbles go outside. And what do you think about our new Power of Moms Author? Spencer, don't jump on Lucy's tail! (Spencer is my two-year-old, and Lucy is the dog we're babysitting for the week). Yes, Ethan! I love what a good job you're doing taking care of the dog. SAREN: Yeah, I think the author is great! Her message is something that I think resonates with moms everywhere. APRIL: Sorry Saren---hold on a second, someone's at the door. Oh, hi! (It's our friends, the dog owners). Thanks for dropping off the dog dish. Have fun on your trip! Okay, I'm back. Did you get a chance to read the Mind Organization for Mom edits yet? SAREN: No, I haven't yet. It's been really busy these past few days, and I've been totally exhausted at night. I'll get to them as soon as I can. APRIL (now folding clothes from the dryer): Oh, don't worry about it. I'll have some more edits in a few days, and you can read them all at once. Arrggh, the dog just came running in the house with mud all over her feet. Ethan, get a towel and clean that up, okay? Alia, it's not time for computer games right now. You've been really patient, and I'll be off in a minute, but please don't ask me while I'm on the phone. No, Grace, I'm not sure if we're going swimming today or not. It's kind of cloudy. We'll talk about it in a second, okay?. Saren, are you still there? SAREN: Yes...someday we're going to look back on these days and wonder how we got anything done. How about we end for now so you can spend time with your children, and we'll talk for a few more minutes later this week? APRIL: Okay, sounds good. Talk to you later. We normally try to schedule our phone calls around nap times or quiet times, but today was one of those days we just had to talk about a few quick things, and there weren't any big chunks of time when our schedules overlapped. We're both trying extremely hard to put our families first, set firm boundaries around our Power of Moms work, and make the best decisions possible regarding the progression of the site. It just feels nearly impossible sometimes. I just had a great phone call this evening with one of our Power of Moms Trainers' husbands (did that all make sense? ), and he gave me tons of exciting tips on how to improve our website and our ability to reach more moms. I wish I could just snap my fingers and make it all happen, but I know it will...with a little work each day, squeezed into whichever minutes I can spare. I can't tell you how grateful I am for all the good people who are volunteering their time to make this site something wonderful. My husband and I had a talk this evening (while I was at the height of the day's frustrations...making dinner, cleaning up the wet swim towels, drafting a letter to a Power of Moms mentor that had to be finished by 6 p.m., answering dozens of questions from very tired children, and wiping smeared watermelon off the tile), and I asked him, "Why am I doing this? Even when I'm organized, I still have to juggle. What if our children grow up and think I was so busy helping other people be good moms that I never had time to be a good mom?" Seriously, that's a question that goes through my mind every day. It's times like that when my husband gives me a hug, tells me that everything will be all right, reassures me that I'm doing a good job with our family, and says, "Someday they'll know why you were doing all this. They'll see what you built, they'll know how much you love them, and they will understand all the sacrifices it required." I think that advice applies to every mom who is trying hard to build a stronger world. If we're careful about how we spend our time, if we're prayerful about the choices we make, and if we make sure we take every opportunity to love our family members, we'll all be the better for it. If you would like to come make friends with me, Allyson, and Saren this summer, and if you happen to be in Rexburg, Idaho July 29-31, please visit us at BYU Idaho's Education Week! We are three of the teachers, but there will be several others there as well--people who have been planning all year to provide an opportunity for mothers to think, learn, and feel rejuvenated. Saren is teaching three motherhood-related series, and Allyson and I are each teaching one youth series, and two "mom" series. This conference is sponsored by The Church of Jesus Christ of Latter-day Saints, and people of all religions are welcome to attend--the principles taught in the classes are applicable to everyone who wants to improve their lives and draw closer to God. If you'd like to look at the main information page for the conference, click here. They also have the whole schedule available online--you can print it out and plan which classes you'd like to attend. Click here to see the entire schedule.